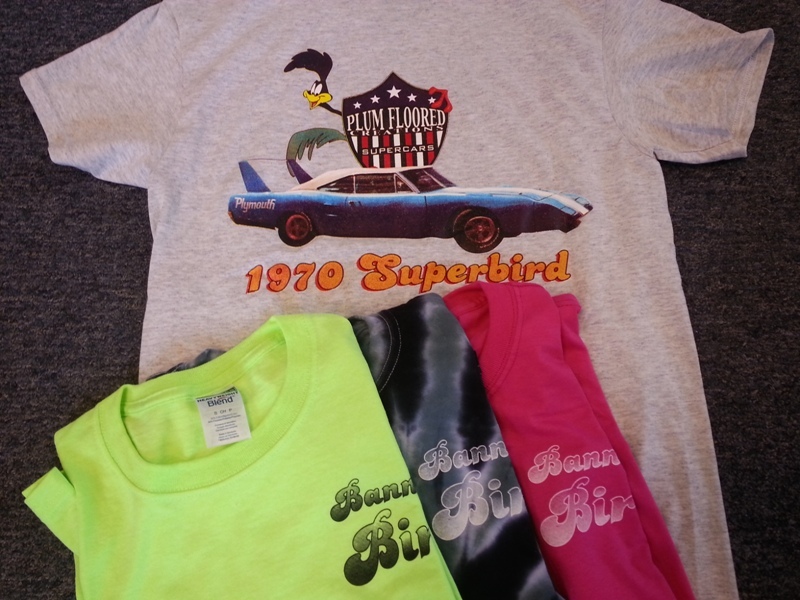 We have shirts and hoodies with the full color Banned Bird on the back. 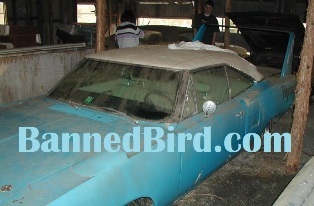 Keep in mind that this graphic is of a WHITE top Superbird. Not sure if anyone has ever made shirts with a white top 'Bird before. Note that this is the first run of shirts, so like a first edition, these could someday be the sought after collector items so don't miss out! T-Shirt, Small no pocket: Gray, Safety Green, Magenta (dark pink), Tye Dye Black/Gray (pix above). T-shirt, Medium no pocket: B5 Blue, Gray, Pink. T-shirt, Medium w/pocket: Dark Blue, Gray/Blue (washed out look). T-shirt, Large no pocket: B5 Blue, Gray, Red, Safety Yellow, Safety Green. T-shirt, Large w/pocket: Royal Blue. T-shirt, X-Large no pocket: B5 Blue, Gray, Tye Dye Safety Orange, Pink. T-shirt, X-Large w/pocket: Royal Blue. T-shirt, 2X no pocket: B5 Blue, Black. T-shirt, 3X no pocket: B5 Blue, Royal Blue, Black. T-shirt, 4X no pocket: Black. Polo Shirt (men's), Large w/pocket: B5 Blue, Royal Blue, Dark Gray. Men's work shirt, Large, 2 pocket, short sleeve: Grey, Black. Men's work shirt, X-Large, 2 pocket, short sleeve: Grey, Black. Hoodie, Small, zipper with pockets: Black. Hoodie, Large, zipper with pockets: Black. Ladies Tank top, Small: B5 Blue, White, Magenta (dark pink). Some smalls do not have the "Banned Bird" script on the front because it does not fit. Ladies Tank top, Medium: B5 Blue, Royal Blue, Pink. T-shirts and Ladies tanks S, M, L, XL: $16 ($20 with pocket). T-shirts 2X, 3X, 4X (no pockets): $20. Men's 2 pocket short sleeve work shirts: $28. Shipping is extra, but we don't mark that up. Well, we may round up to the nearest dollar but we don't go crazy on shipping costs!